Automatically and accurately measures coatings on ANY metal. The Defelsko PosiTest DFT Combo Electronic Paint Thickness Gauge measures the paint thickness on all metals, including steel and aluminum. Before you buy a used car or begin reconditioning a damaged finish, check the paint's thickness for clues about its condition and history. 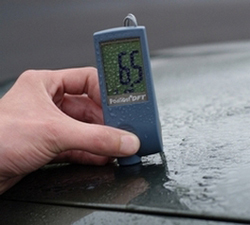 The Defelsko PosiTest DFT Combo Electronic Paint Thickness Gauge provides invaluable information for car professionals, detailers, and car buyers! The Defelsko PosiTest DFT Combo Electronic Paint Thickness Gauge is superior to other paint gauges on the market because it works on any metal and it automatically identifies the surface. Measurements are displayed instantly on a large LCD screen that is viewable from any angle. Detailers, both professional and hobbyists, use the Defelsko PosiTest DFT Combo Electronic Paint Thickness Gauge to determine the depth of paint to avoid over-polishing. With this powerful knowledge, you'll know what areas of the vehicle to avoid or where to tread gently when removing imperfections. Car Refinishers can deliver an even, consistent paint finish by identifying thin or thick areas of paint and adjusting the application accordingly. Using the Defelsko PosiTest DFT Combo Electronic Paint Thickness Gauge improves the quality of a repaint and takes the guesswork out of getting an even coat. Simply hold the Defelsko PosiTest DFT Combo Electronic Paint Thickness Gauge against the paint to take quick, accurate measurements. Body shop and repair technicians can identify areas of thin paint or determine the depth of paint damage, such as water spot etching. The Defelsko PosiTest DFT Combo Electronic Paint Thickness Gauge identifies where more clear coating or paint stripping is needed. Car buyers or dealerships can identify refinish work on vehicles. Areas of thicker paint indicate refinish work, which impacts the value of a vehicle. Previously you had to rely on a visual inspection but now the Defelsko PosiTest DFT Combo Electronic Paint Thickness Gauge can tell you for sure if the vehicle has undergone body work. Don't go to a car auction without it! The PosiTest DFT Combo Paint Thickness Gauge displays the measurement right-side up no matter how you turn it on a large LCD screen. The Defelsko PosiTest DFT Combo Electronic Paint Thickness Gauge takes accurate readings in all weather conditions. 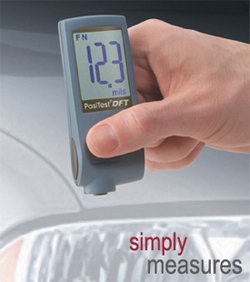 The Defelsko PosiTest DFT Combo Electronic Paint Thickness Gauge requires no calibration and no set-up. 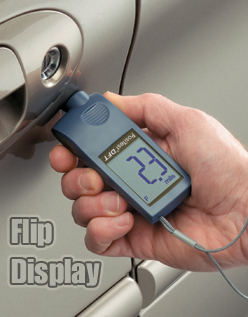 Use it right out of the box to measure coating thickness on any metal. A certificate of calibration is included. Use the Defelsko PosiTest DFT Combo Electronic Paint Thickness Gauge in all weather conditions. It has durable construction with a built-in wrist strap and innovative flip screen that allows it to be viewed from any position. The Defelsko Paint Gauge has the largest LCD screen available on the market. The Defelsko PosiTest DFT Combo Electronic Paint Thickness Gauge works instantly and gives you a clear, digital reading of paint thickness. Its speed makes it easy for you to take multiple readings on a panel to compare thicknesses and see the big picture. Thicker patches of paint indicate some type of repainting, whether its to patch a rust spot or to cover repair work. Knowing this information in advance of polishing or purchasing a car will help you make informed decisions concerning the value, condition, and potential trouble spots of the vehicle. Anyone with the need to control the amount of paint being applied or removed to a vehicle recognizes considerable benefits from a paint thickness meter. That includes detailers, repair technicians, car appraisers, and car buyers. The Defelsko PosiTest DFT Combo Electronic Paint Thickness Gauge provides quick, accurate paint thickness measurements on any metal. Arm yourself with all the facts before embarking on major detail work or a used car purchase. You'll be glad you did!